Definition: DNA repair mechanisms comprise relatively simple single-step enzyme reactions catalyzed by monomeric proteins which directly reverse base damage to DNA. In some cases, these reversal reactions require specific cofactors, in some cases not. It is a collection of processes by which a cell identifies and corrects damage to the DNA molecules that encode its genome. In human cells, both normal metabolic activities and environmental factors such as radiation can cause DNA damage, resulting in as many as 1 million individual molecular lesions per cell per day. DNA repair ensures the survival of a species by enabling parental DNA to be inherited as faithfully as possible by offspring. It also preserves the health of an individual. Mutations in the genetic code can lead to cancer and other genetic diseases. For many years, exogenous sources of damage have been thought to be the primary cause of DNA mutations leading to cancer. However, Jackson and Loeb proposed that endogenous sources of DNA damage also contribute significantly to mutations that lead to malignancy. Both environmental and cellular sources can result in similar types of DNA damage. DNA damage occurs continuously as a result of various factors—intracellular metabolism, replication, and exposure to genotoxic agents, such as ionizing radiation and chemotherapy. If left unrepaired, this damage could result in changes or mutations within the cell genomic material. Hereditary nonpolyposis colorectal cancer results from a mutation in the MSH2 and MLH1 proteins, which repair mismatches during replication. Xeroderma pigmentosum (XP) is another condition that results from failed DNA repair. Patients with XP are highly sensitive to light, exhibit premature skin aging, and are prone to malignant skin tumors because the XP proteins, many of which mediate nucleotide excision repair, can no longer function. Mechanisms of DNA Repair: DNA damage signaling and checkpoint control pathways are among the most commonly mutated networks in human tumors. Emerging data suggest that synthetic lethal interactions between mutated oncogenes or tumor suppressor genes with molecules involved in the DNA damage response and DNA repair pathways can be therapeutically exploited to preferentially kill cancer cells. Cells cannot function if DNA damage corrupts the integrity and accessibility of essential information in the genome (but cells remain superficially functional when non-essential genes are missing or damaged). Depending on the type of damage inflicted on the DNA’s double helical structure, a variety of repair strategies have evolved to restore lost information. If possible, cells use the unmodified complementary strand of the DNA or the sister chromatid as a template to recover the original information. Without access to a template, cells use an error-prone recovery mechanism known as translesion synthesis as a last resort. A group of proteins known as mismatch excision repair (MMR) enzymes is capable of correcting errors of replication not detected by the proofreading activities of DNA polymerase. MMR enzymes excise an incorrect nucleotide from the daughter DNA and repair the strand using W-C pairing and the parent DNA strand as the correct template. This is especially crucial for errors generated during the replication of microsatellite regions, as the proofreading activity of DNA polymerase does not detect these errors. To a lesser degree, MMR enzymes also correct a variety of base pair anomalies resulting from DNA oxidation or alkylation. 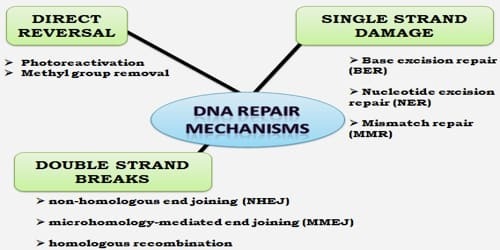 Future Applications of DNA repair: While DNA damage is a key factor in the development and evolution of cancer cells; continued damage is used as part of clinical treatments for cancer, forcing malignant cells into apoptosis or senescence. Many chemotherapeutic drugs such as bleomycin, mitomycin, and cisplatin, are effective because they cause further DNA damage in cancer cells that replicate at a faster rate than surrounding tissue. 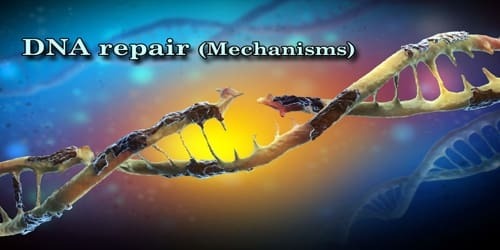 Cellular DNA repair mechanisms are a double-edged sword; by reducing mutations that may lead to cancer, these processes strive for genomic integrity, but the same mechanisms in malignant cells allow those cells to survive additional DNA damage and continue uncontrolled growth. DNA damage response mechanisms trigger a cell-cycle arrest and attempt to repair DNA lesions or promote cell death/senescence if repair is not possible. Replication stress is observed in preneoplastic cells due to increased proliferation signals from oncogenic mutations. Replication stress is characterized by increased replication initiation/origin firing; increased transcription and collisions of transcription-replication complexes; nucleotide deficiency; an increase in reactive oxygen species (ROS).